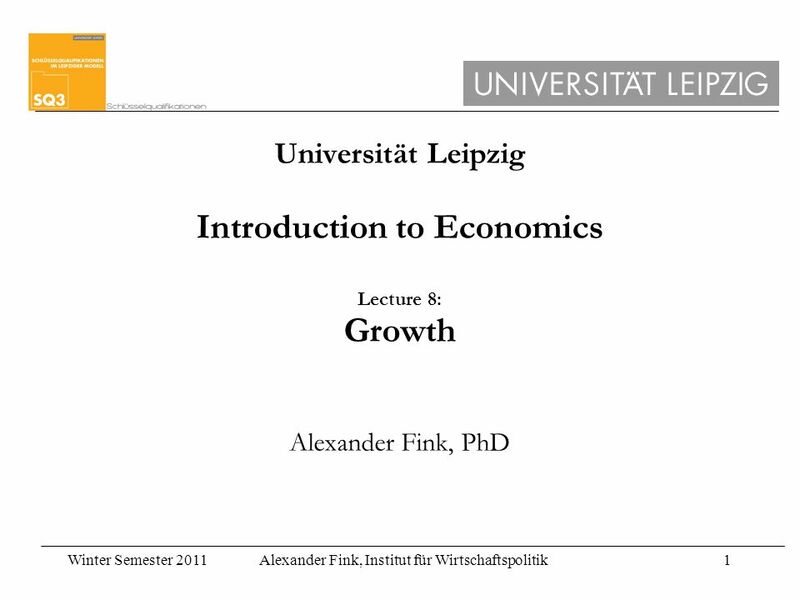 Winter Semester 2011Alexander Fink, Institut für Wirtschaftspolitik1 Universität Leipzig Introduction to Economics Lecture 8: Growth Alexander Fink, PhD. 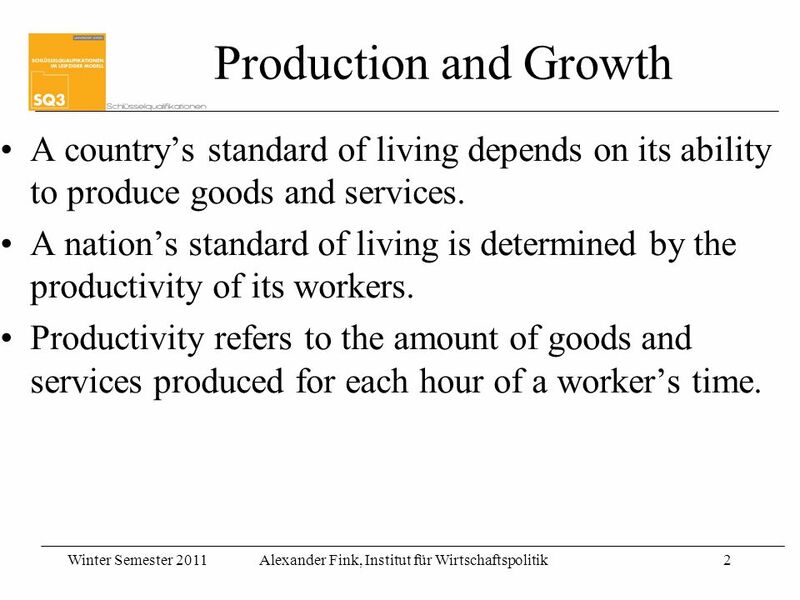 2 Winter Semester 2011Alexander Fink, Institut für Wirtschaftspolitik2 Production and Growth A countrys standard of living depends on its ability to produce goods and services. 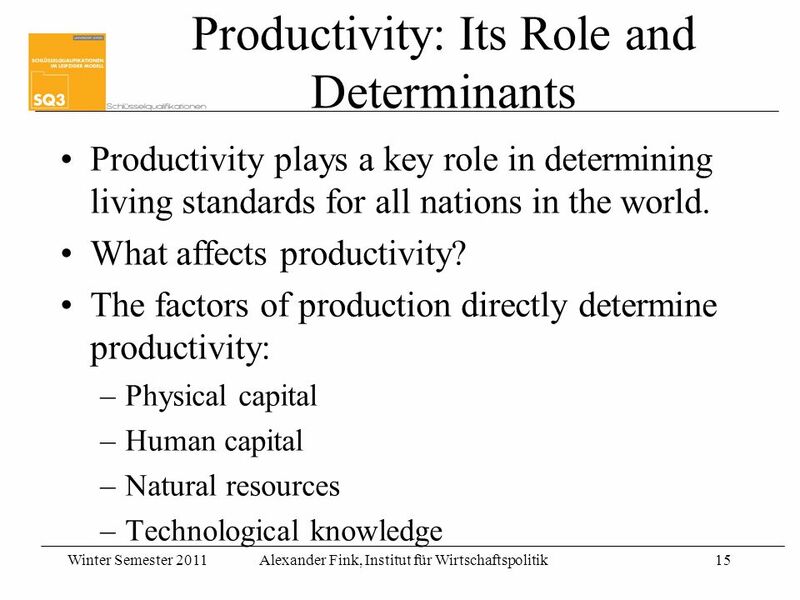 A nations standard of living is determined by the productivity of its workers. 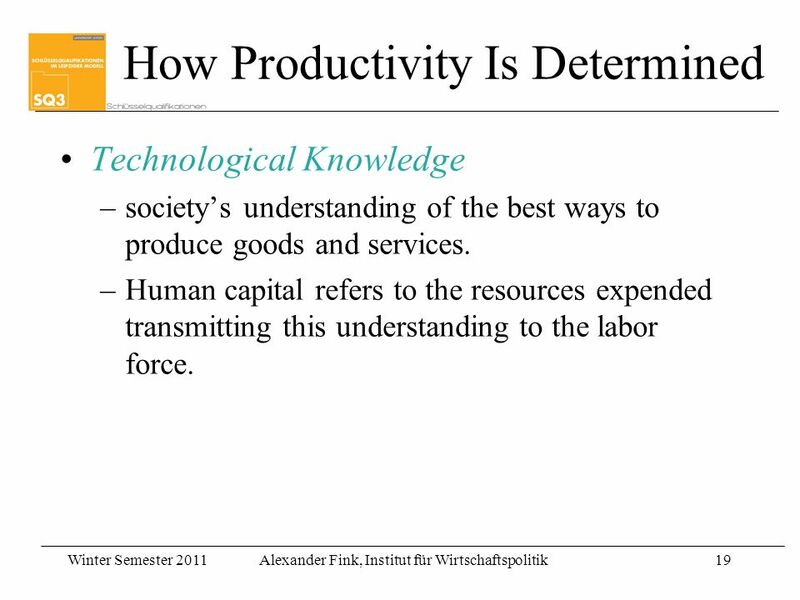 ProductivityProductivity refers to the amount of goods and services produced for each hour of a workers time. 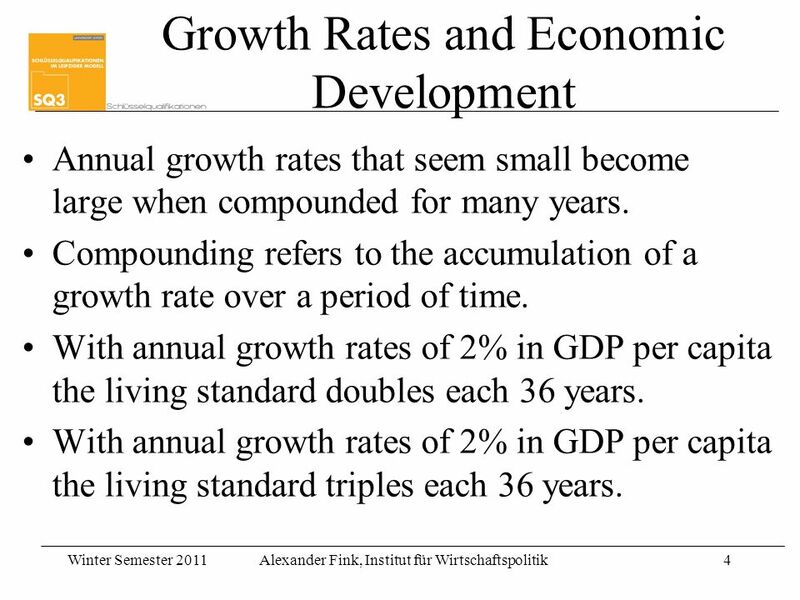 4 Winter Semester 2011Alexander Fink, Institut für Wirtschaftspolitik4 Growth Rates and Economic Development Annual growth rates that seem small become large when compounded for many years. 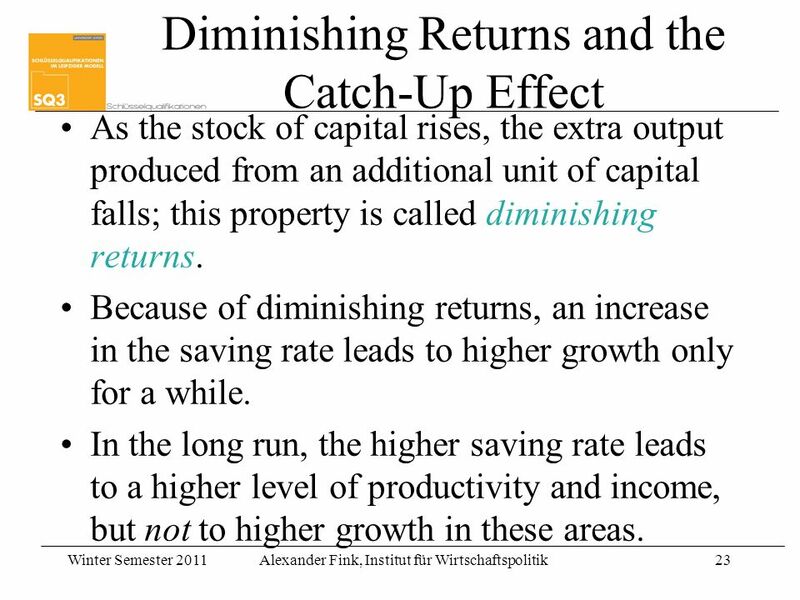 Compounding refers to the accumulation of a growth rate over a period of time. 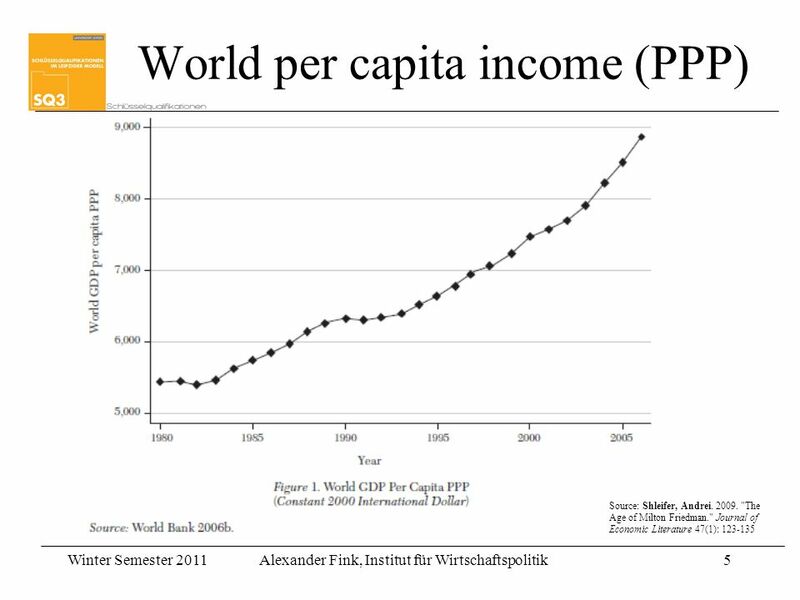 With annual growth rates of 2% in GDP per capita the living standard doubles each 36 years. 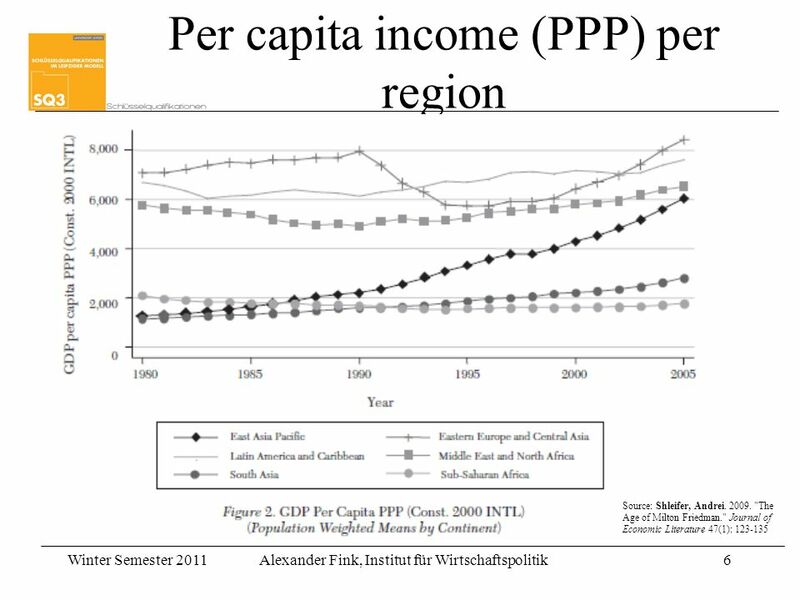 With annual growth rates of 2% in GDP per capita the living standard triples each 36 years. 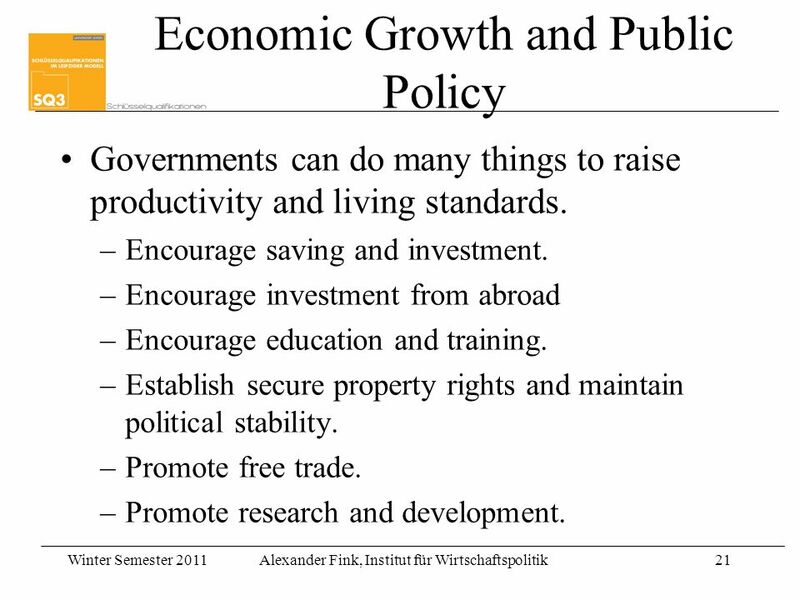 21 Winter Semester 2011Alexander Fink, Institut für Wirtschaftspolitik21 Economic Growth and Public Policy Governments can do many things to raise productivity and living standards. 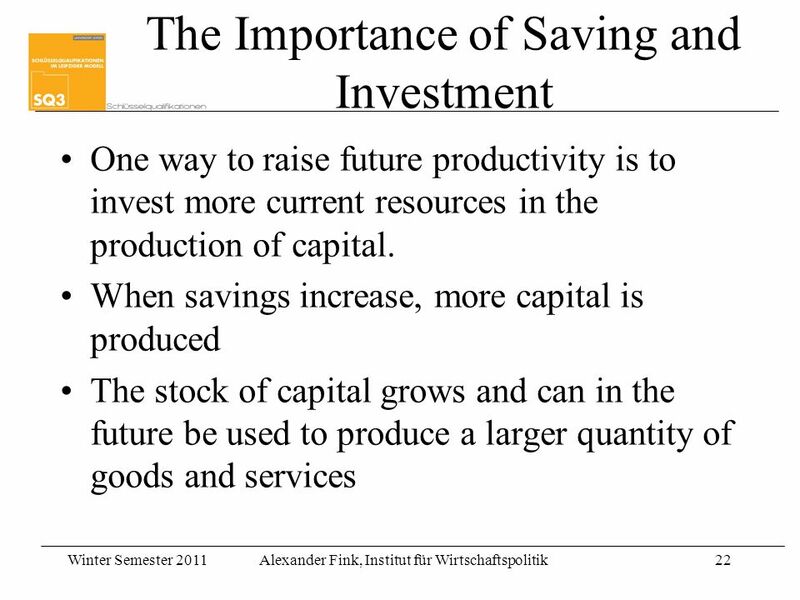 –Encourage saving and investment. 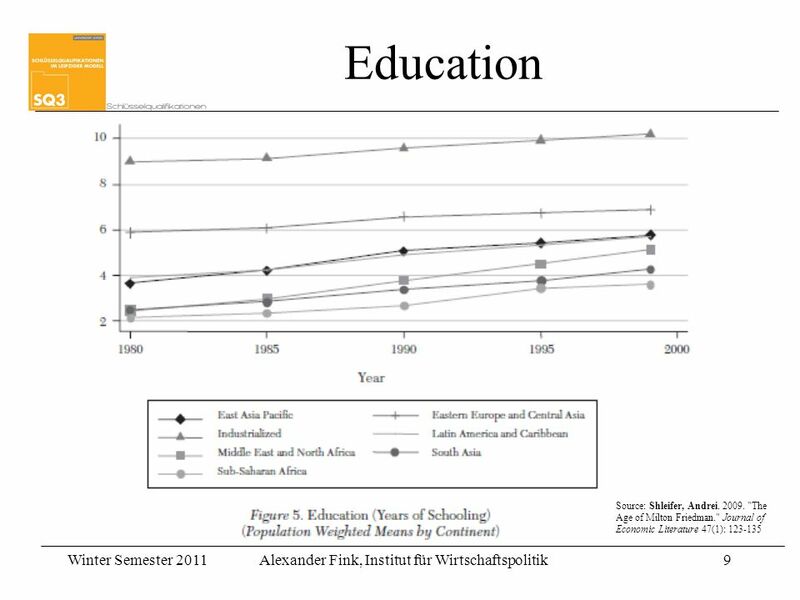 –Encourage investment from abroad –Encourage education and training. 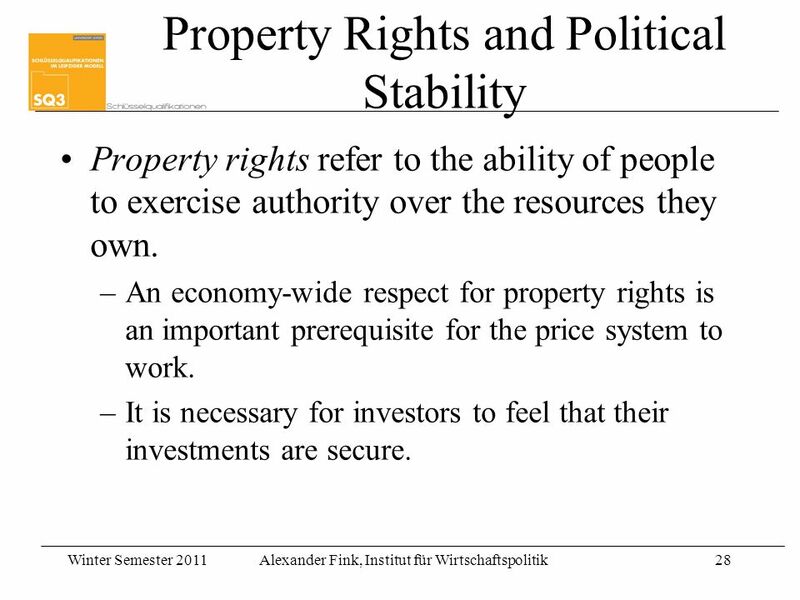 –Establish secure property rights and maintain political stability. 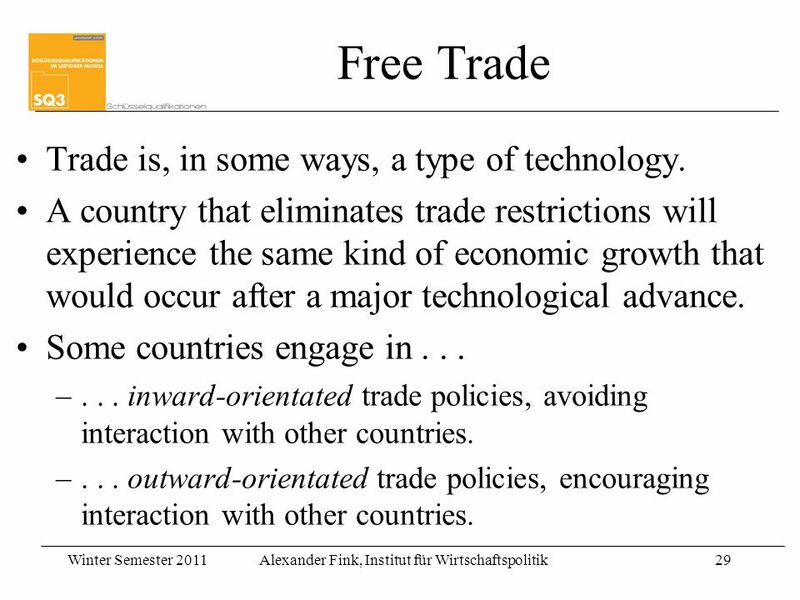 –Promote free trade. 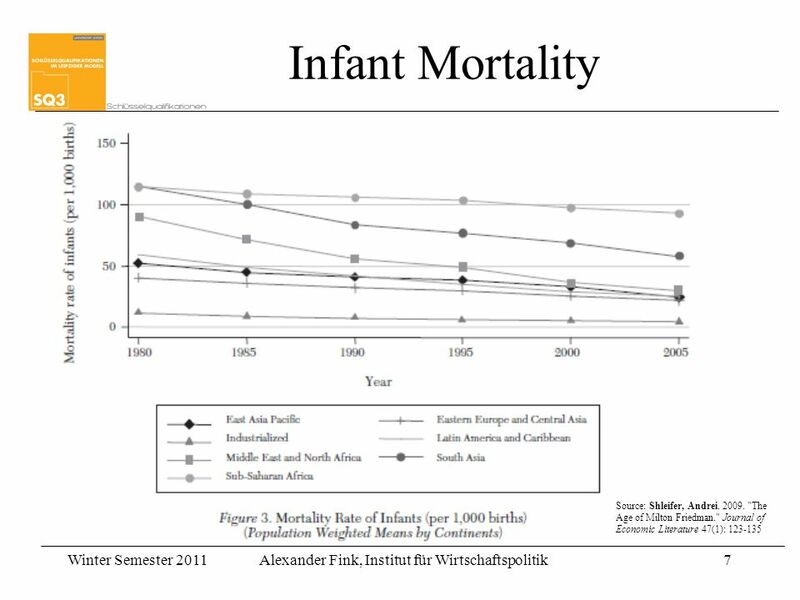 –Promote research and development. 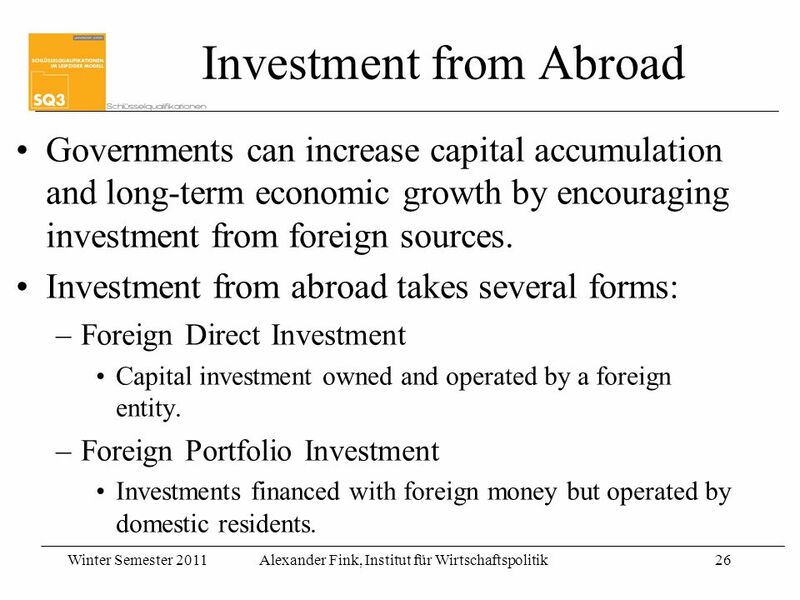 24 Winter Semester 2011Alexander Fink, Institut für Wirtschaftspolitik24 BIP pro Kopf der Bevölkerung - 10.000 20.000 30.000 182018301840185018601870188018901900191019201930194019501960197019801990 WesteuropaEuropäische AblegerJapan Asien (ohne Japan)LateinamerikaOsteuropa Afrika 1990 in Dollar Source: Maddison Wirtschaftswachstum rund um die Welt Abbildung 2: Abnehmender Grenzertrag des Kapitals 2008 © Schäffer-Poeschel Verlag für Wirtschaft Steuern Recht GmbH www.sp-dozenten.de Institut für Wirtschaftswissenschaft. Universität Erlangen-Nürnberg. 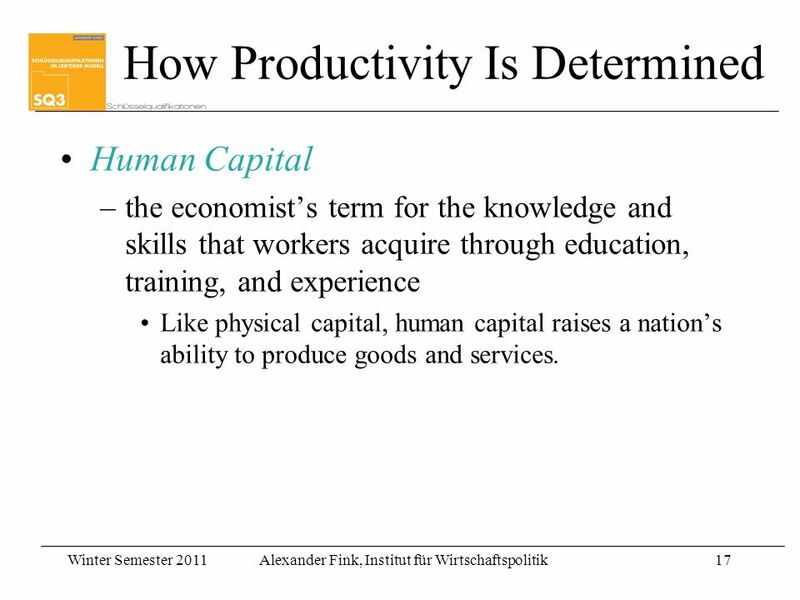 1 1 Output per worker Capital per worker 2. 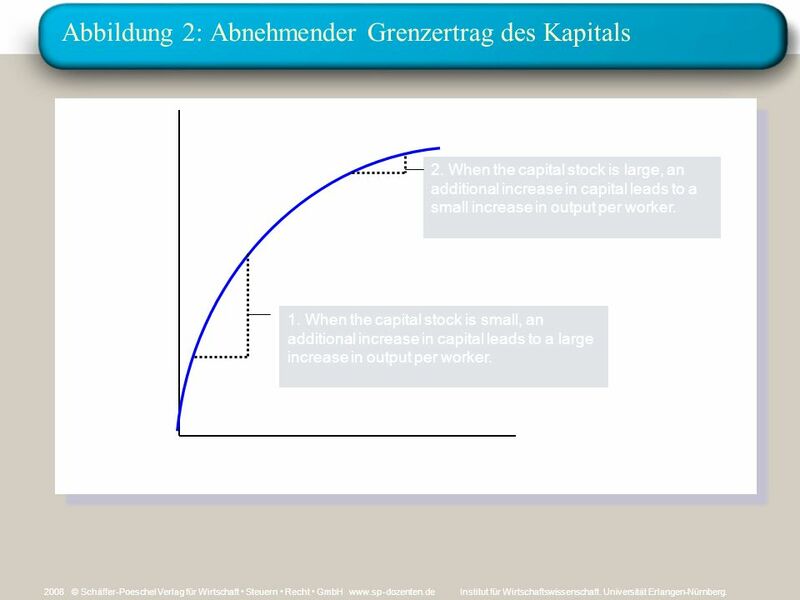 When the capital stock is large, an additional increase in capital leads to a small increase in output per worker. 1. 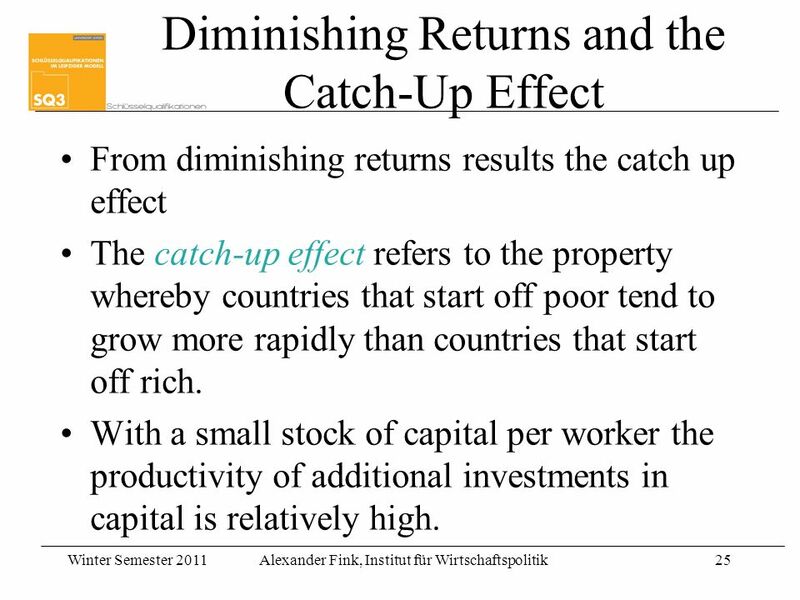 When the capital stock is small, an additional increase in capital leads to a large increase in output per worker. 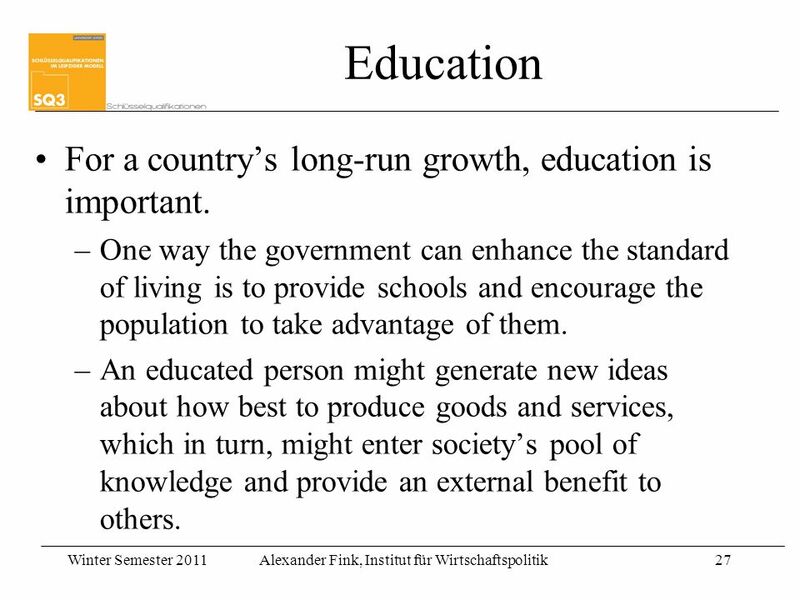 Download ppt "Winter Semester 2011Alexander Fink, Institut für Wirtschaftspolitik1 Universität Leipzig Introduction to Economics Lecture 8: Growth Alexander Fink, PhD." 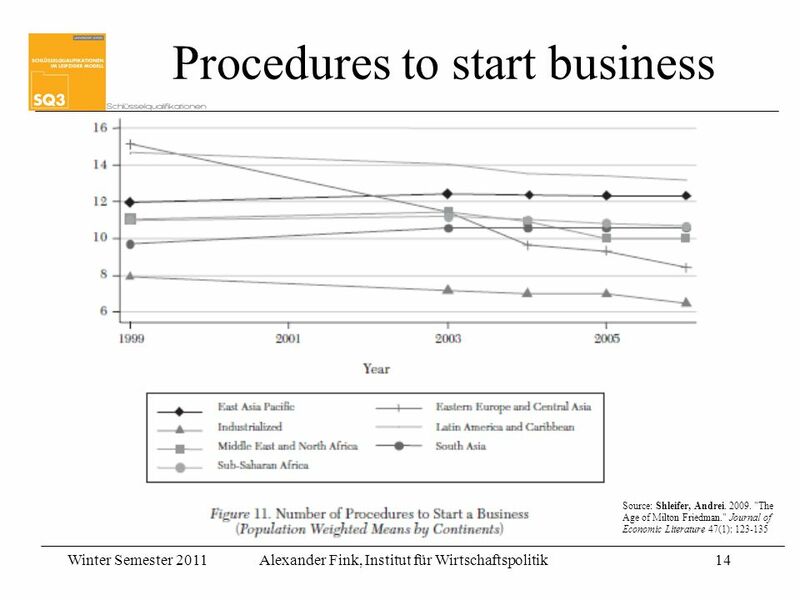 Winter Semester 2011Alexander Fink, Institut für Wirtschaftspolitik1 Universität Leipzig Introduction to Economics Lecture 9: Business Cycles Alexander. 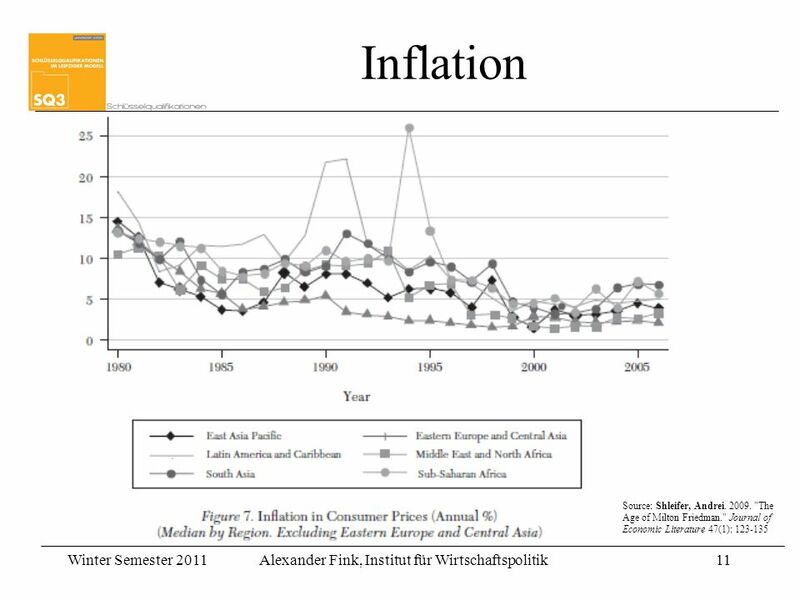 u A countrys standard of living depends on its ability to produce goods and services. 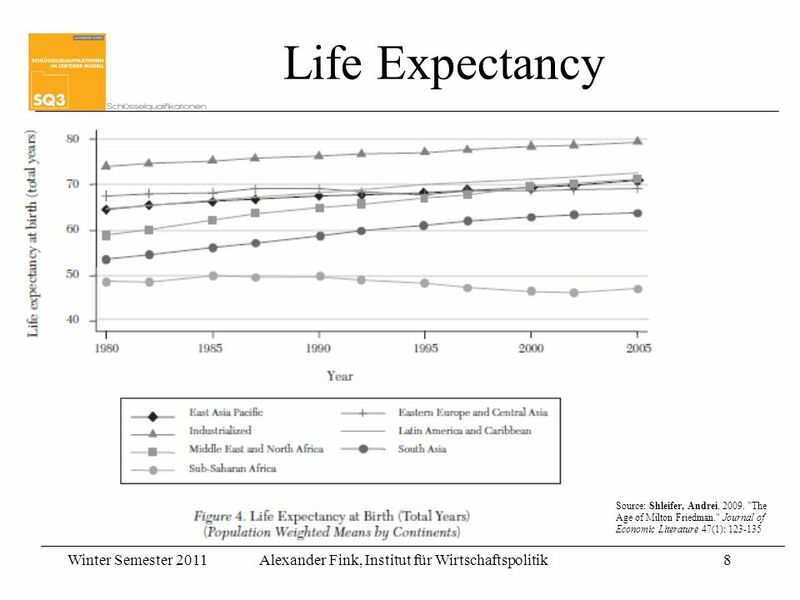 u Within a country there are large changes in the standard of living. 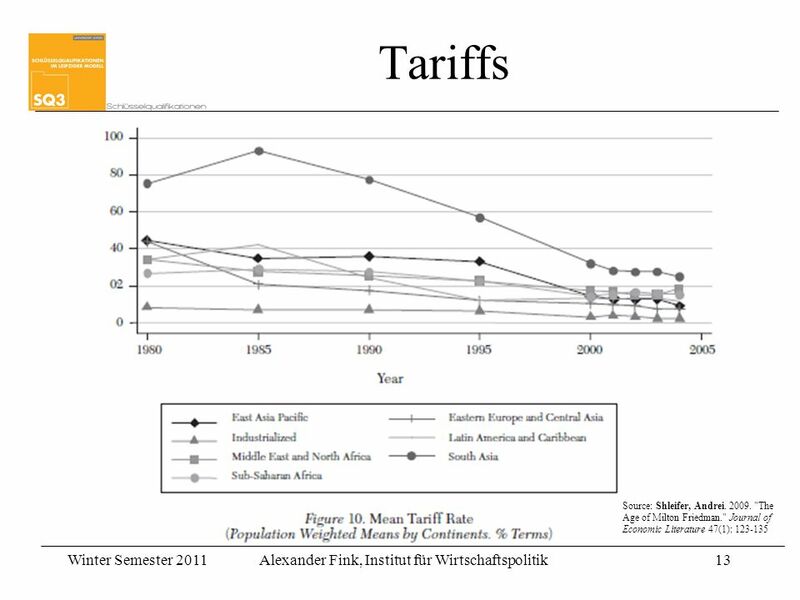 Mankiw: Brief Principles of Macroeconomics, Second Edition (Harcourt, 2001) Ch. 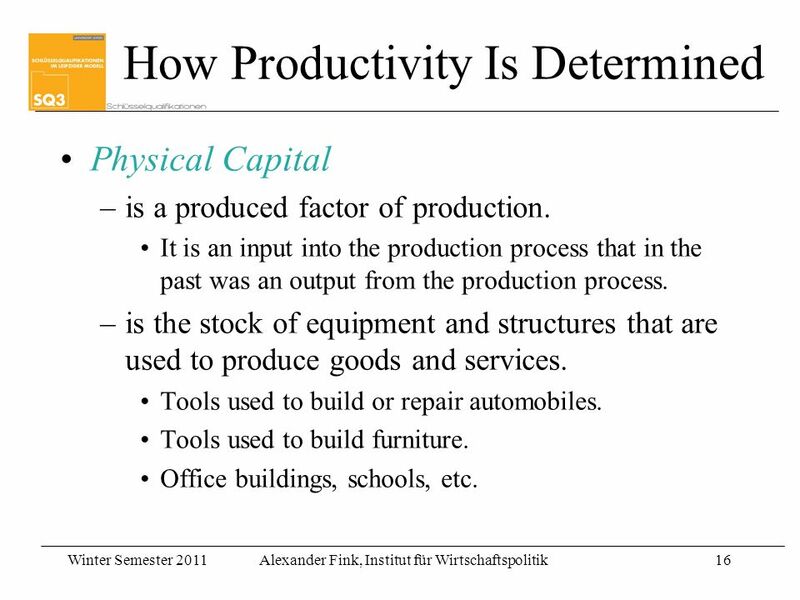 7: Production and Growth. Production and Growth Chapter 24 Copyright © 2001 by Harcourt, Inc. All rights reserved. Requests for permission to make copies of any part of the work. 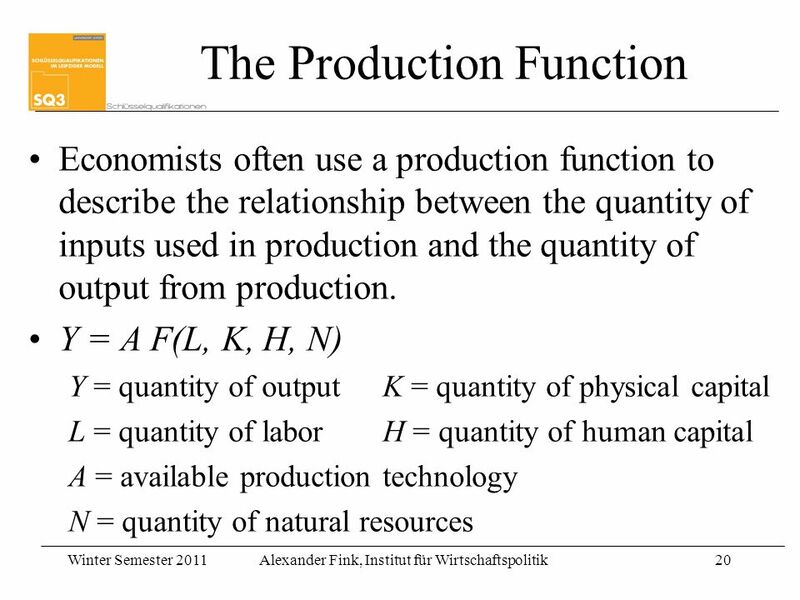 Production and Growth A country’s standard of living depends on its ability to produce goods and services. 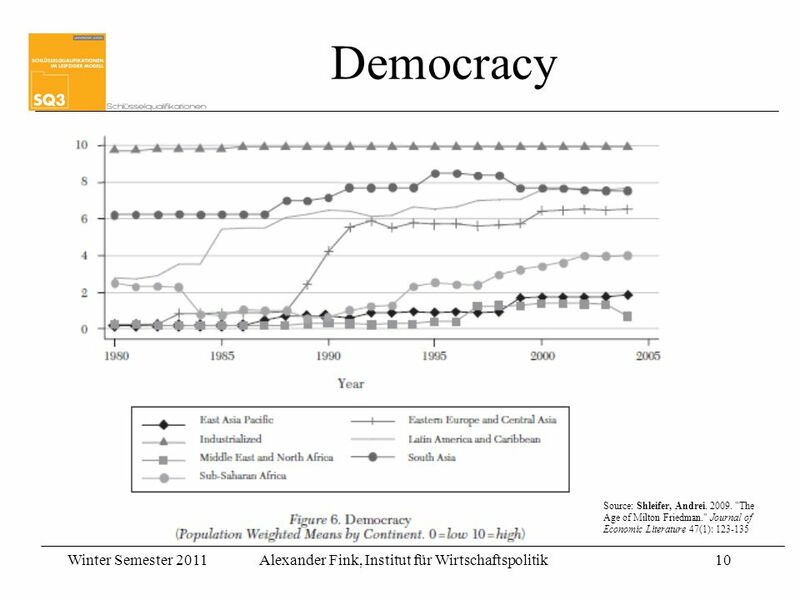 Within a country there are large changes in. Production and Growth Chapter 25. Unit 15. Economic Growth IES Lluís de Requesens (Molins de Rei)‏ Batxillerat Social Economics (CLIL) – Innovació en Llengües Estrangeres Jordi Franch Parella. Chapter 12 Production and Growth. 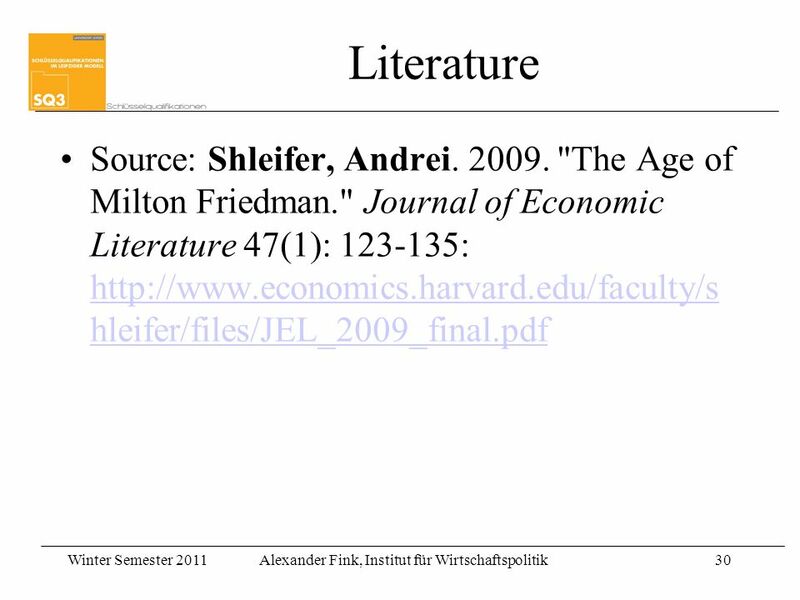 Macroeconomics. 1. 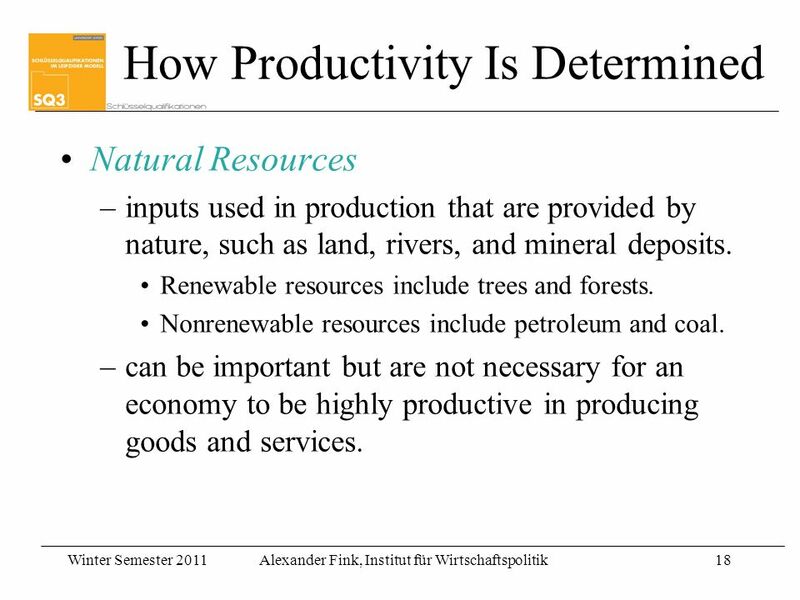 Circular flow – the movement of output and income from one sector of the economy to another. Long Run Growth Chapter 26. 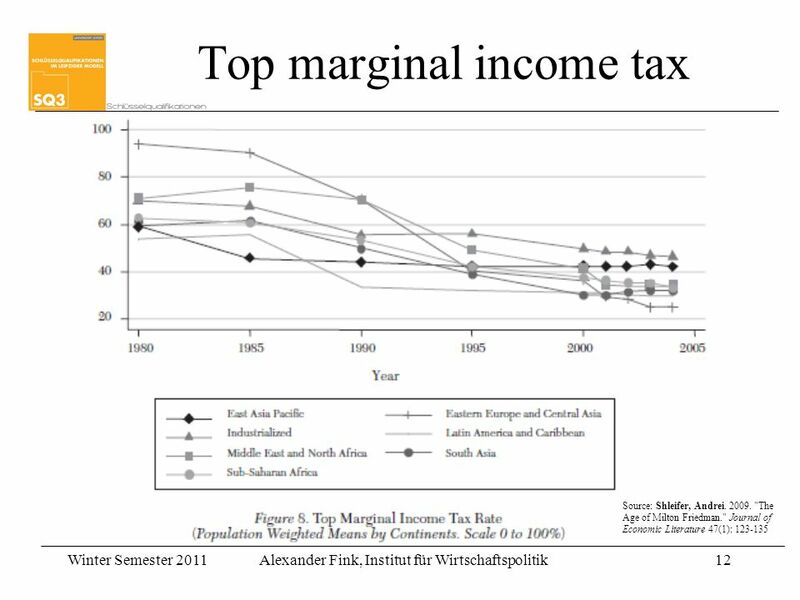 Wide Variation in Income per Capita, 2000. 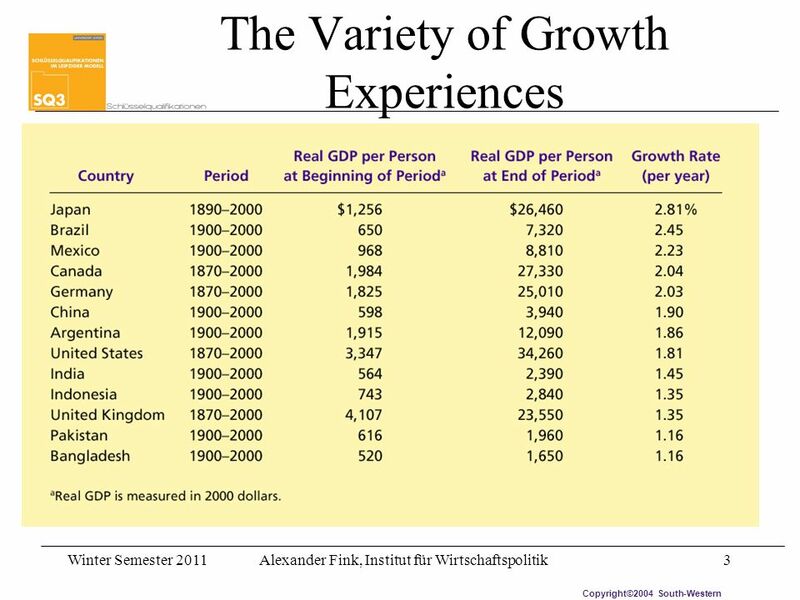 1 Chap 12 – measuring growth in GDP and determinants of GDP Measuring growth in GDP The production function, it’s properties and the measure of productivity.